Bulugh al-Maram is the shortened name of the collection of hadith by al-Hafidh ibn Hajar al-Asqalani entitled, Bulugh al-Maram min Adillat al- Ahkam (translation: Attainment of the Objective According to Evidences of the Ordinances). It contains a total of 1358 hadiths., At the end of each hadith narrated in Bulugh al-Maram, al-Hafidh ibn Hajar mentions who collected that hadith originally. The Hadith are generally from Sahih al-Bukhari, Sahih Muslim, Sunan Abu Dawud, Jami at-Tirmidhi, 'Sunan al-Nasa'i, 'Sunan ibn Majah, Musnad Ahmad ibn Hanbal and other books of Hadith. 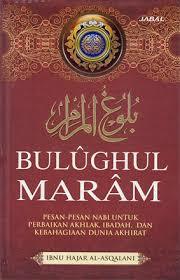 Bulugh al-Maram holds a unique distinction in that all the hadith compiled in the book have been the sources for fiqh (Islamic Jurisprudence) rulings. Among the topic that this book covers are subjects ranging from marriage, business transactions to other more implicit aspect of the religion such as the five pillars. One more distinctive feature, along with others, is that the versions have also been shortened to present just the main purpose of the Hadith according to its classification under the chapter. Because of these preferential qualities, Bulugh Al-Maram has been accepted widely and is among the most sought-after books of Ahadith. En Islam, les prescriptions du Fiqh (le licite, l'illicite, le recommandé, etc.) trouve sa base dans les textes (le Coran et la Sunna). Dans Bulûgh al-Marâm, le grand traditionniste Ibn Hajar expose les plus importants hadîth du fiqh, et ce en se basant surtout sur les ouvrages de traditions suivants : Musnad Ahmad, Sahîh Bukhârî, Sahîh Muslim, Sunan Abu Dawûd, Sunan at-Tirmidhi, Sunan an-Nasâ'i, et Sunan Ibn Mâja. Le lecteur trouvera près de 1600 Hadîth traitant des deux grandes parties du fiqh: le rituel (la prière, le jeûne, le pèlerinage, etc.) et les relations (les ventes, le mariage, les crimes et délits, etc.) Sans oublier quelques sujets divers (la piété filiale, les invocations, etc. ).